GenTarget’s proprietary Fusion in vivo, PCR cloning technology provides us with an edge when it comes to cloning your target protein into our optimized expression vectors. Our auto-induction medium provides us with a worry-free induction protocol for expression. And in case the expressed protein is very toxic, or expressed mainly in an inclusion body, we will use our self-tight-controlled cloning cells. The expressed protein, with a His tag, will be purified by affinity chromatography. Please contact us for a service quote. Utilizing GenTarget’s advanced lentiviral vector system, we will clone your target into our lentiviral vector with a His tag, generate expression lentiviral particles, and transduce them into mammalian suspension cells for expression. Under antibiotic selection pressure, only transduced cells will grow and express the target protein. This controlled semi-stable cell line expression system demonstrates high protein expression levels without actually building a stable cell line. The beauty of using the lentiviral system is that lentiviral particles give the highest transduction rate in suspension cells, which can easily generate a large population of target expressing cells. This is a great way to obtain mammalian-expressed protein at a very low cost! 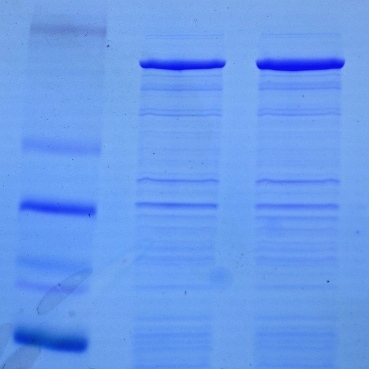 The His-tagged expressed proteins will be purified by affinity chromatography. Please contact us for a service quote.